Vigan, Philippines, December 9, 1941- The Japanese Imperial Forces landed in Mindoro beach. Vigan folks initially suspected the ships offshore were Americans. There had been some "maneuver" activities (bivouac) by new army recruits in previous months. Many went to Mindoro beach as curiosity seekers and met by Japanese gun fires as they landed on the beachhead. A vehicle full of soldiers from Tamag Hills barracks went to welcome or see for themselves, but they were ambushed by the Japanese at the curve in barrio Bulala where most were killed. The people at home, evacuated to barrio Paoa and took cover along the creek east of Ernesto Amores present home, and stayed at the house of Lakay Doro Amores. The girls: Anita, Fe, Lydia, and Mirope dressed themselves as old women and later went back home for safety. Later, the extended family evacuated by boat(paraw) to Candon, staying with our relatives in barrio Paratong until it was much safer in Vigan. Great-grandmother Macaria "Aket" Andino was left to mind the house. The Japanese Occupation Forces appointed Dr. Gregorio Favis as the town mayor. When food supply was becoming scarce, we were forced to lugaw(porridge), camote(sweet potato), sago(arrow root), and our two(2) rimas(bread fruit) trees near Amang's nipa hut helped us a lot. Mayor Favis decreed people not to eat rice on Sundays. We experimented with a lot of possible food to get nourishment especially for the child Amado. There were times when lugaw was mixed with the pith of papaya tree. This had bad side-effects as the eyes became swollen after a few meals. Ambas(Marcelo) and Kulas Amistad started a jar-making business. They constructed the "kamarin"(factory) just south of Amistad's residence and named their joint venture MARNIC(Marcelo-Nicolas). Andoy(Jovito) sacrificed so much in the construction of the "kamarin" and he eventually mastered the trade of jar making. The business, mostly by barter trade, made life more bearable for our family. Burnays(earthen jars) were traded with rice, bagoong(salted shrimp dip), tagapulot(raw sugar), and dried fish. Rice was stored in small cans/containers and secretly placed in locations around the backyard. In 1939, Amang(Felicisimo) closed the FIGAMO business in Vigan when partner Tata Mining(Herminio) Figueras joined Kodak Philippines. He was later employed in the Philippine Constabulary -CIS Lab, while Herminio joined the National Bureau of Investigation, Medico Legal Section - formerly Department of Investigation. Amang was one of those assigned to round-up the Japanese in Manila at the outbreak of World War II. Surprisingly, the Japanese were prepared because even the children had knapsacks/backpacks ready. He took the second bus trip to Ilocos because the first bus did not reach Vigan. He saw dead human bodies, animal corpses, and books/papers scattered along the highway. When the war broke out, Army sergeant Primo "Momo" Amores was serving with the Signal Corps of the Philippine Commonwealth Army. They were sent to defend Bataan peninsula until the "surrender"on April 9, 1942. Momo did not surrender to the Japanese Imperial Army, instead he escaped the infamous Death March via Orani, Bataan to Tinajeros, Pampanga where he got sick from malaria. He recovered and stayed for a while with his sister Tancing(Tarcila) in Manila, then proceeded to Vigan. Amang and Momo organized a guerilla unit known as "The Bolo Unit" in barrio Pagbantayan, Vigan attached to the United States Armed Forced in the Philippines -Northern Luzon(USAFP-NL). Andoy was in charge of the Women's Auxiliary Corps(WAC) in Vigan. He trained women in first-aid as support group of the guerilla liberation movement. The guerilla unit moved from Vigan to San Esteban and then to San Juan, La Union. The late Col. Floro Crisologo of Vigan was with us in San Esteban, Ilocos Sur. Amang was assigned to S-3 Section(Plans and Training Unit), and Momo was in S-2 Section(Intelligence Unit) both at the Headquarters, 121st Infantry Regiment in San Juan, La Union. The 121st Infantry Regiment was responsible for the liberation of Bessang Pass, a Japanese Army stronghold, near Cervantes, Ilocos Sur and the capture of Japanese Gen. Tomoyuki Yamashita aka "The Tiger of Malaya". 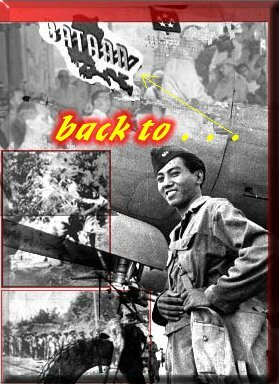 After the war, Amang did not claim for back pay or pension because he believes that it is every citizen's duty to defend and serve his country without benefits. The late Tata Rodring Avila was also a veteran of the historic Battle of Bessang Pass as a volunteer porter of ammunitions and supplies. The bravery of the Filipinos in this battle proves that they are the true sons of Diego Silang- a revolutionary war hero during Spain's colonial rule and who declared a short-lived Ilocos Republic. This story reminds the younger generations how life is miserable in times of war. The brutality of the Japanese and the bravery of Filipinos and Americans shall serve a lesson to future generations that in war there are no victors, only victims.